Episode 16 of Reconnect featured guest, Ken Chitwood, sharing an article he wrote entitled, “Building Bridges: Toward Constructing a Christian Foundation for Inter-Religious Relationships in the Shift from Religious Privilege to Spiritual Plurality”. The key points for inter-religious dialog that Ken suggests are: pay attention, find, and form, friendships, listen and learn, dine, dialog, and do together, discern, and witness to the worldview. While I agree with many of Ken’s points to approaching inter-religious dialog, I have a different application of the term “building bridges”. I explain this approach in an article that I wrote for Reformation 21: “Embracing Religious Contradictions to Proclaim Christ Crucified: Tolerance and Coexistence”. Looking at Acts 17, I see how Paul knew the beliefs and culture of those he was sharing the Gospel of Jesus. He made the presentation of the Gospel from starting within their belief system with a point of contact that he could use to make a connection to the Biblical narrative of salvation. I was given the opportunity to share this approach to evangelism at Brookfield Lutheran Church in Brookfield, Wisconsin. This episode contains that sermon message. Senior pastor at Brookfield Lutheran Church, Robert Mrosko, was a guest on Reconnect Episode 39, discussing Star Wars. The building bridges technique I am advocating for is also shared in Episode 34: “Storytelling Evangelism”. 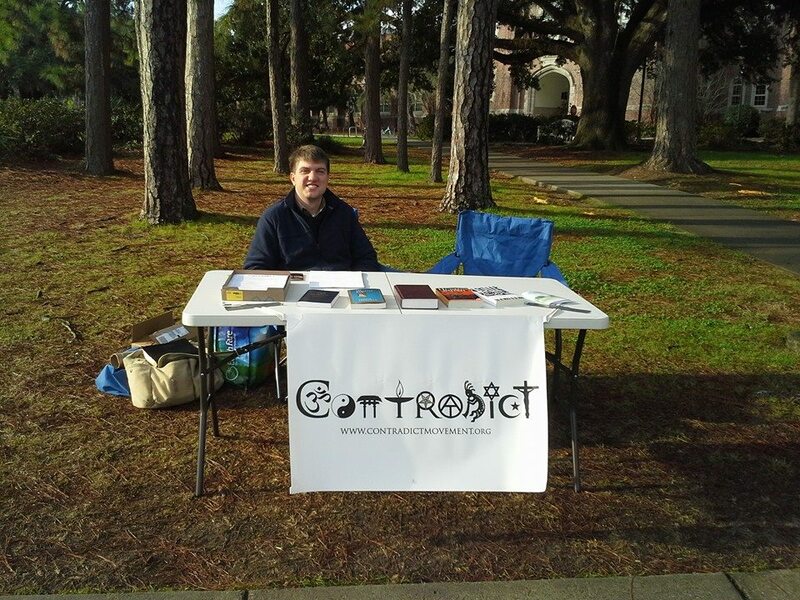 Dan Palmere at Florida State University, sharing the Gospel using a Contradict poster. He is a member of the campus’ Ratio Christi club. When I decided to begin sharing Contradict with a broader audience than tabletop evangelism, I chose to start a Web site with the name Contradict Movement. Calling trends, fads, and new tendencies “movements” seems to be a popular development of its own lately. I think that what I’d like to see happen is for Contradict to spread, classifying as a movement in the tradition sense of organizing and rallying the troops behind a cause of action or expression. In a way I was jumping on the movement-branding bandwagon, but I have a dual meaning in mind. I intend the term Contradict Movement to refer to the movement of the Holy Spirit as he leads Christians to share the good news of Jesus Christ. Jesus indicates this unpredictable movement of the Holy Spirit in his often-quoted discourse to Nicodemus in John chapter 3, saying, “The wind blows wherever it pleases. You hear its sound, but you cannot tell where it comes from or where it is going. So it is with everyone born of the Spirit” (verse 8). With this in mind, each Christian reading this book will likely be prompted to share the gospel with others in ways that I haven’t yet perceived. Maybe some readers will be moved to step directly into the manner in which I have shared Contradict, using a poster at a college campus. The objective of the Contradict Movement is to counter the spirit of this age that all religions are equally valid and true, that all roads and paths lead to God. It is more specific than this, however. A conservative Muslim could easily stand alongside a conservative Christian and boldly proclaim, “We worship a different God.” Grounded in the Christian worldview, my goal is to move people not only to see that all religions can’t be true, but to point them to Jesus Christ as mankind’s one and only, all-sufficient Savior. Then I want to prayerfully and winsomely reason with them in the various marketplaces of life to which God has called each Christian to serve and be his witnesses. To participate in this movement, a person is not required to use the Contradict logo I have made. Many people are likely participating in this movement already without having seen Contradict; in fact I think this movement goes all the way back to the beginning of humanity. God’s people have always stood in opposition to the patterns of this world which lure us to exchange the truth of God for a lie, enticing us to bow down to the things of God’s creation rather than worship and praise the Creator. It is not surprising that the lies of pluralism have infiltrated the ranks of the visible church. Jesus indicated that this would happen with his parable of the wheat and the weeds (Matthew 13:24–30). Lies, the Enemy, and people who claim to be followers of Christ but are not will spring up within Christ’s church (Matthew 13:36–43). You can see Satan’s sowing of lies within the church in the way that a large percentage of Christians in America have embraced certain New Age elements within their Christian beliefs and practices. With the lie swallowed and craved by society and even within the church, taking a stance in our pluralistic age will receive harsh criticism. This is what Jesus promised would happen. He said, “Brother will betray brother to death, and a father his child. Children will rebel against their parents and have them put to death. All men will hate you because of me, but he who stands firm to the end will be saved” (Mark 13:13). Everyone in the church won’t stand firm. Jesus promised this too. He said that when persecution comes, “many will turn away from the faith and will betray many people” (Matthew 24:10). This is why those of us who are standing upon Christ, pointing to Jesus as the only way to salvation, must band together, meet with one another, and encourage each other as we see the signs of the day of the Lord approaching (Hebrews 10:25). Click this image to get 25% of my book, Contradict – They Can’t All Be True, for Free! My grandparents on my mother’s side were both Lutheran from NC. I have no idea how far back it goes on my granddad’s side of the family. My understanding is that my grandmother was the first believer in her family. She went to church on her own since she was 5 or 6 years old and always did until she was married to my granddad. They then raised my mom in a Lutheran Church. My mom married a Roman Catholic and so my dad’s whole side of the family was Roman Catholic, and now they are splintering into other denominations, but the bulk is still Catholic. I initially was brought up going to Roman Catholic masses until second grade when we went to a Presbyterian Church, then we landed Lutheran when I was in 7th grade. I had a horrid confirmation and I didn’t learn what Lutherans actually believe. I grew up in TN so I was heavily Baptist influenced and from my background I didn’t think it mattered what denomination you went to. I thought the differences was mostly in the worship styles at services. In high school I visited other churches on Wednesdays and I quickly found that there were plenty of differences doctrinally, and it wasn’t until after high school when I was hounded by a group to be baptized because my first baptism didn’t count because I was an infant and because I continued to actively deny the command to be baptized I wasn’t saved or a Christian, that I really dug in with my pastor and learned what the Scriptures said and finally claimed Lutheran as the denomination that was right (not the one I preferred, which to be honest based on my experiences, it wasn’t the one I preferred). I went to Concordia Irvine when I was 21 and it was there that I discovered that I wasn’t actually a Lutheran. I agreed with the sacraments, but I didn’t know anything about the doctrine of election. I had essentially been taught Arminian (Decision Theology) my whole life. After a lot of wrestling with God and professors, I came full swing I can say that I am in agreement with Lutheran theology. My heart actually aches for those who confess Christ as Lord, speak of his salvation for us, but still live under the yoke of the law. I pray that the Lord sees them as believing, but needing help from him with their unbelief.